The new MSBA.org is a thorough innovation, and a key step in making our tradition of excellence ready for the future. We’ve completely rebuilt our website from the ground up to bring MSBA members more value. Manage your account, find events and learning opportunities, and connect with other members – from anywhere, at any time. Learn more about how to get started. 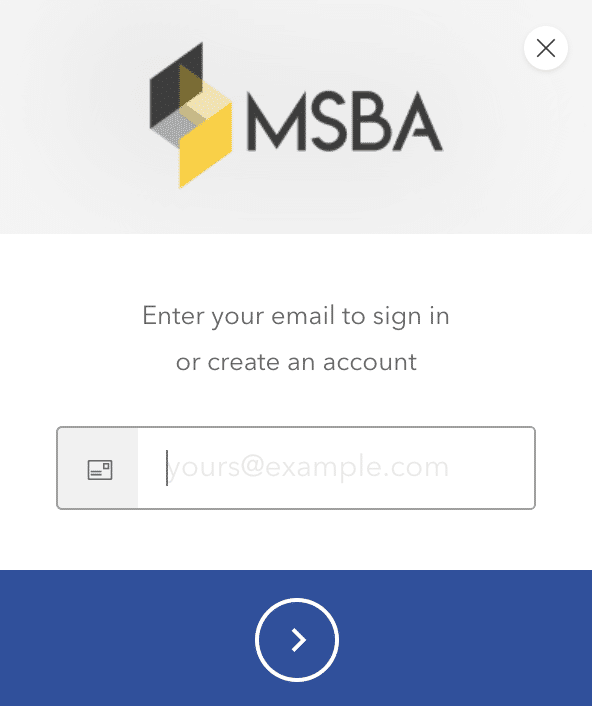 Signing into your MSBA.org account is easier than ever. Simply click the “login” button, and enter the email address associated with your MSBA membership. You’ll get an email with a one-time use secure link. Click that to be taken back to the site, right where you left off… and you’ll be logged in. Don’t know what email address is associated with your account? That’s ok. Enter any preferred email address to be able to login. If this by chance creates a duplicate account for you in our system, that’s ok. Simply alert MSBA staff by live chat on the site, and we can quickly “merge” your existing account data with your new preferred email address. You’ll want to use this email address to login to the site moving forward. To create an account, click the “login” button. You’ll be prompted to enter your email address. Enter the email address you prefer. You’ll receive a secure, one-time-use verification link in your inbox. Click the link, and you’ll automatically be registered on MSBA.org. How do I get help on the site? 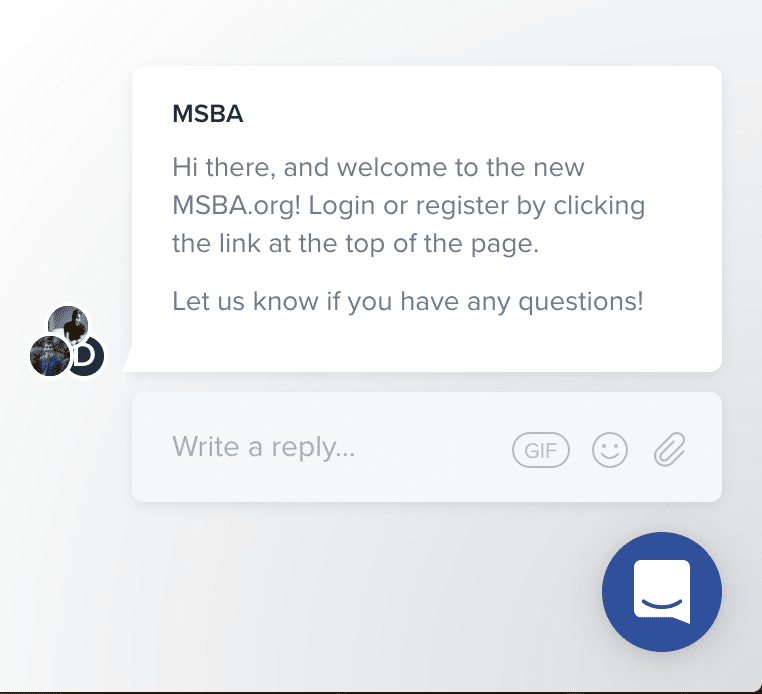 You can instantly contact MSBA staff at any time by clicking the chat icon at the bottom of your screen. If our staff are busy and can’t get back to you, we’ll ask for your email address and someone will respond to you via email as soon as possible. Why is MSBA.org using password-free login? Password-free login allows you to sign in with the push of a button. You don’t need to remember long, complicated passwords and usernames. The new login and registration process uses existing information from accounts you already have. No passwords means there’s nothing to forget, misplace, or have stolen. Your identity is safe. Why doesn’t my old username and password work? MSBA is taking extra steps to improve the security of our members’ personal data. Our new password-free login system is part of this effort. It keeps your information safer and allows you to access your account with just a few clicks. MSBA no longer stores any passwords online, which means there’s nothing to lose, forget, or have stolen. We verify your identity every time you access the site by using one of your existing accounts. Your login information is safe and unique to you. How are you keeping my credit card information secure? None of your credit card information is stored on MSBA.org. We’ve partnered with one of the leading online payment processors, Stripe, to make sure that sensitive financial information is handled as safely and securely as possible. I’m having trouble accessing Fastcase. 1) Refresh your web browser. 2) Make sure you’re logged in to MSBA.org and have an active membership. 3) If you are logged in to MSBA.org, are an active member, and still can’t access Fastcase, there may be a discrepancy between the email address associated with your MSBA account and Fastcase. In this case, please contact us by phone or live chat so that we can assist you in merging your accounts. MSBA staff are ready to help you. Just click the chat icon, enter your question, and someone will assist you.